Located 5 minutes' drive from the historic center of Ostuni, Hotel Park Novecento Resort dates back to 1840 and offers landscaped gardens with a swimming pool and sun terrace. 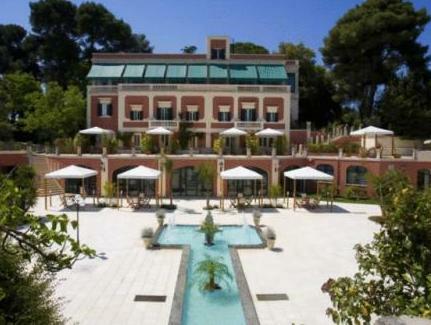 Throughout the gardens at Hotel Park Novecento you will various fountains, water features, and reading areas. All rooms are air conditioned and feature a mini-bar and plasma-screen TV with satellite channels. Some rooms have a patio overlooking the gardens where guests can enjoy breakfast. Parking is free at the Park Hotel. Ostuni Railway Station is 3.7 mi away, while you can reach the coast of Puglia in around 20 minutes by car. Transfer services are available on request to both Bari and Brindisi airports. Please note that laundry service and transfer services come at extra costs. Please note that the car park is not guarded. Breakfast was good but found the rooms to be dark and dreary.